The female lays eggs in holes about a foot deep under host Palo Verde trees where the grubs then feed on the roots. These large beetles, 3 to 4 inches in length, in the Order Coleoptera, emerge from quarter-size exit holes with the summer monsoons. 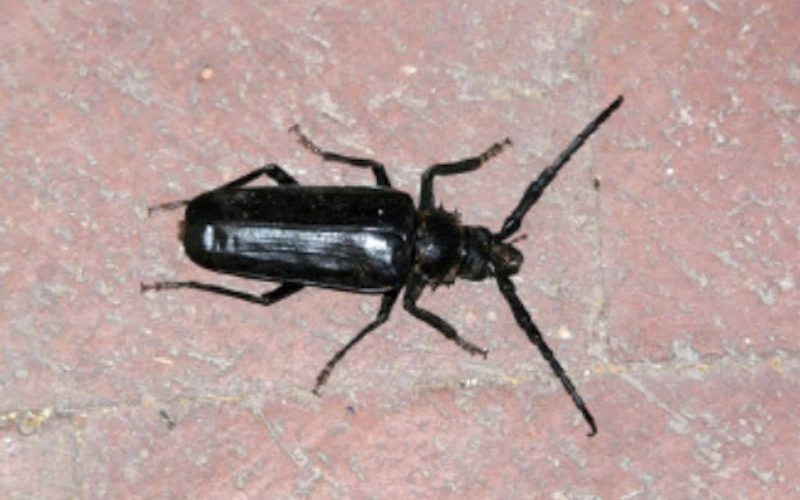 They resemble giant cockroaches with long antennae, sharp mandibles and a spiny exoskeleton. They have a collar of spines on the thorax. They fly at dusk. They soon mate and the female lays eggs in holes about a foot deep under host Palo Verde trees or other desert trees where the grubs then feed on the roots. Larvae have strong mandibles and have been known to chew through PVC pipe. The larval stage lasts about 3 years before they pupate, thus undergoing complete metamorphosis. They range from California to Texas and are called the Mesquite Root Borer in New Mexico. The adults usually die soon after mating. Although the males will fight over a female, they are generally harmless to humans. However, like any animal they will bite if provoked. They are attracted to light, so shutting porch lights will remove an attractant to your home (the same could be said of other insects such as scorpions). These beetles present little danger to healthy trees and tend to favor distressed plants. A symptom of their presence may be dieback of branches. This photograph was taken on the author’s front porch in the Catalina Foothills.